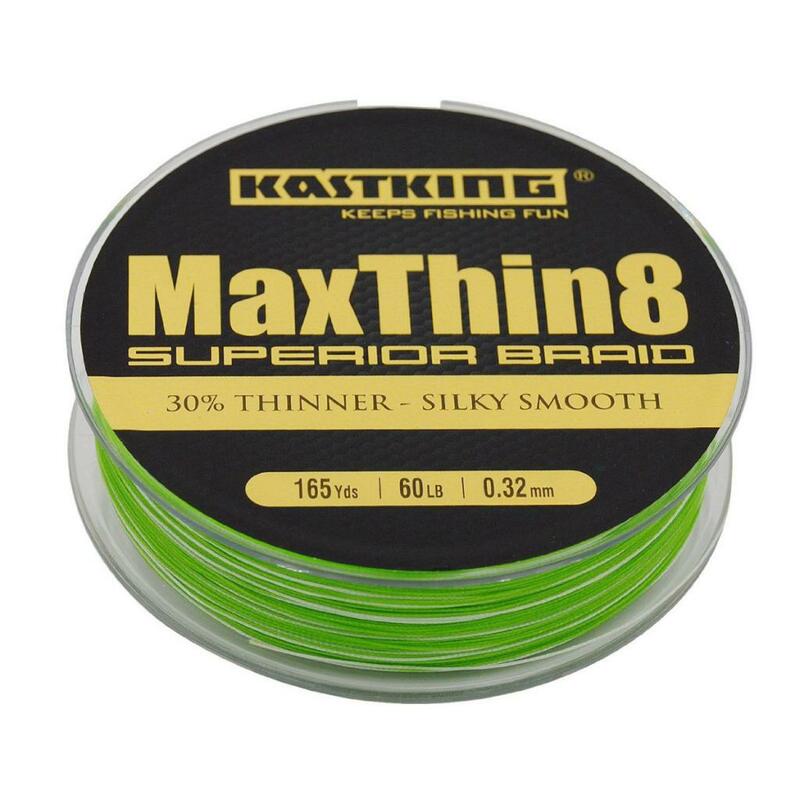 KastKing MaxThin8 Superior Braid is the thinnest 8 strand braid fishing line with incredible abrasion resistance and knot strength.KastKing MaxThin Superior Braid 8-strand line is wrapped tighter and is up to 30% thinner than other brand braid lines. KastKing MaxThin8 Superior braided line is super thin, super strong, and silky smooth with 8 strand braided fishing line. Perfectly round and smoother super braid fishing line for unequalled casting distance and overall fishability for saltwater or freshwater fishing. A High tech manufacturing process and special formula gives KastKing MaxThin8 Superior Braid line zero memory, fantastic knot strength,silkiness,and longer, smoother casts.KastKing MaxThin8 Superior 8 strand braided fishing line has zero stretch that creates a super line with extreme sensitivity that delivers rock solid hooksets for all types of fishing. The super thin diameter of KastKing MaxThin8 Superior Braid 8 stand fishing line gives more spool capacity than the competition and has less resistance to wind and water currents.KastKing MaxThin8 Braid line slices through thick vegetation, stands up to rough structure.MaxThin8's ultra-thin diameter is a fantastic braided line for deep water, swift currents, and helps reduce wind line-bowing. MaxThin8 Superior Braid line comes in tensile strengths from 16lb to 60lbs. KastKing MaxThin8 braid line to superline braid and braided fishing lines by Power Pro, PowerPro Slick 8, Sufix, Berkley, Spiderwire, Stealth, Spiderwire Ultracast, Sufix 832 or Seaguar braided line.